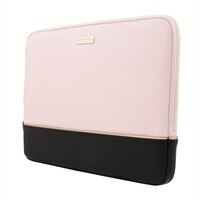 Work and travel have never looked better with the kate spade new york Sleeve. With sleek metallic accents and bold designs with vibrant colors, your device will be protected in style. Crafted with chic, premium materials. Protective, shock absorbent interior lining. Gold zipper and hardware detailing. Gold Saffiano stripe for added style. Available for Laptops and Microsoft Surface.